We are pleased to write this fifth annual letter to Euclidean’s limited partners. In this letter, we discuss Euclidean’s 2012 performance. We then build on the perspectives regarding our approach, performance, and prospects shared in recent letters to all of you. 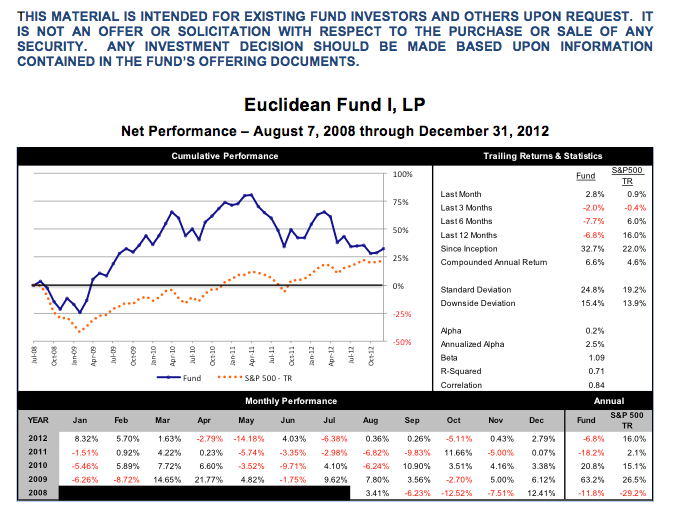 During the 12-month period ending December 31, 2012, Euclidean returned -6.8% after fees to its investors. During this same period, the S&P 500’s Total Return (that is, the index return including dividends reinvested) was +16.0%. During the year, we exited 16 positions that we held for an average of 20 months. The cumulative total return on these 16 positions is +18%. We ended the year with realized net long-term gains of $6.0M. Since inception, our partnership has returned +33% while the S&P 500’s Total Return has been +22%. These aggregate gains translate into annualized compounded returns of +6.6% and +4.6%, respectively. The realized gains, when considered in the context of the partnership’s 2012 decline in market value, reflect that we are holding shares in a number of companies where our assessment of their fundamentals remains strong even as those companies’ share prices have fallen during the year. We think it is helpful to frequently reinforce the nature of how Euclidean invests. We hope that doing so provides you with useful context for considering our performance and prospects. We founded Euclidean because we wanted a process-driven approach, informed by the most informative lessons of history, for investing our own money. The questions we wondered about were the following: 1) Are there timeless lessons regarding how to tell if one company is inherently more valuable than another? 2) Are there timeless lessons regarding the price you can safely pay for a given company when seeking to compound wealth over long periods? As we sought answers to those questions, we imagined how an exceptional investor might evaluate a potential investment. After becoming familiar with how a company serves customers, manages expenses, and deploys capital, this investor would be equipped to compare the company with his experiences involving similar investments from the past. To the extent that those analogs, or “comparables,” in the past had done well, his confidence in the new opportunity would be high, and the converse would also be true. This investor’s success would come from being exceptional in three respects. The first one is obvious – he must have accumulated a significant amount of meaningful experience from which to draw upon when making decisions. Next, he must have distilled the right lessons from a lifetime of experience that was surely peppered with red herrings – for example, foolish investments that luckily worked out and instances when sound application of his expertise led to losses. Last, in the context of sometimes earth-trembling current developments, he must bring an almost inhuman level of discipline to avoiding the temptation to deviate from an investment process seeped in his historical experiences. With this image in mind, we aspired to emulate these qualities of our exceptional investor through data. We knew from our own experiences building a business that how well a company serves customers, manages expenses, and deploys capital is reflected in its financial statements. So, our first step was to use machine-learning technologies to digest the financial statements and investment outcomes of every domestic public company, at every point in time, across many years. This step gave us a basis for evaluating today’s equity investment options in light of how similar opportunities in the past actually performed. This step also showed that the historical record is unambiguous: There are timeless principles for evaluating companies and estimating the prices at which good businesses tend to make good long-term investments. These principles are easy to understand and, characterized by findings such as “too much debt can be dangerous” and “all else being equal, lower prices are better than higher prices” are grounded in common sense. We saw that by strictly adhering to these principles, an investor could have achieved good results over most long-term periods during the past 40 years. Our next steps were to develop infrastructure for systematically applying these principles when selecting long-term investments and, anticipating that there would be intermediate periods of challenging performance, to commit to adhering to this process through thick and thin. What Does Euclidean’s Recent Performance Tell You? Given this context, how does one make sense of Euclidean’s difficult performance over the past two years? In our November letter, we shared our views on this subject, which we summarize here. Another observation was that Euclidean’s performance during 2011 and 2012 would likely have been significantly stronger if we had limited our investment universe to the S&P 500, and excluded all small and mid-capitalization companies. We feel this observation is important. Our examination of stock market history going back to the 1960s found that it was most fruitful to buy the lowest priced companies – without considering their size – that have a favorable combination of earning power, returns on capital, revenue growth, and balance sheet strength. Further, our findings were clear that any portfolio management rule that limits the investment universe is highly likely to materially and negatively impact long-term returns. This makes sense as one would be more likely to find the best investments if he examined more, not fewer, potential opportunities. So, what to make of this? Other investment managers have noted these same observations and proposed various causes in their comments and letters to investors. Some have pointed out the general flight of money out of equities and, in search of perceived safe sources of income, the concentration of remaining equity investment dollars in large capitalization dividend payers. Others have noted the absence of catalysts, such as private equity deals and corporate M&A, which historically have caused smaller company valuations to revert to their intrinsic value. Still others hypothesize that professional money managers, responding to their clients’ heightened focus on short-term returns, liquidity, and volatility, have been unwilling to own less liquid, smaller companies and reluctant to pursue pure value investment strategies. The dynamic here might be described as passing on an opportunity to buy a company’s shares worth $1.00 for $0.70 because of concerns that those shares may drop well below $0.70 before they recover. Whatever perspectives you find most compelling, the fundamental questions are: Do you conclude that the dynamics in the market today reflect permanent, structural changes such that the historical relationships on which Euclidean depends and that which have persisted through time will no longer hold? Or do you conclude that these dynamics are unusual and tied to a unique period, such that the relationships on which Euclidean depends will reassert themselves? With the fiscal cliff, Eurozone crisis, historically low interest rates, an evolving balance of power among nations, and the rapid pace of innovation, it is natural to wonder whether the rules of the game are changing. We note, however, that during many periods in the past one might have rightly wondered the same thing. In the past 100 years (among many other shocking developments), there have been world wars, Treasury yields fluctuating between 0% and 17%, the emergence of radio, television, computers, and the Internet, and more than 100 sovereign debt defaults and restructurings worldwide. During each period, the world was forever changed. The balance of economic power among nations evolved, certain industries emerged while others disappeared, and valuation multiples went on wild rides. Even so, we believe the general principles of value investing would have been fruitful across these volatile long-term periods. The persistency of value strategies is supported by an extraordinary amount of research showing them to outperform the market by meaningful margins over the long-term periods of the past. We have discussed studies by Eugene Fama and Kenneth French, David Dreman, Tweedy Browne, and others in prior letters. Our own research, shared before and summarized on the next page, is from early 2008 and aligns with their findings. The following simulated portfolios show three very simple approaches for systematically adhering to “value” principles. Each simulated portfolio was constructed to hold 100 positions and to rebalance annually. Please review them closely, as well as the additional detail on the simulations provided in the footnote. We find two things particularly meaningful about these simulations. First, a good route to realizing above-average returns seems to have been defining a process – however simplistic – for buying companies’ shares at less than an intrinsically grounded estimate of what they are worth. Second, throughout the past 40 years, even as there would have been frequent temptation to alter one’s investment strategy in reaction to current events, one would have done remarkably well ignoring all external developments and adhering to these simple value strategies without modification. These findings are also compelling because they are complemented by the robust track records of value investors, well documented to the 1920s. These investors include John Maynard Keynes, Benjamin Graham, Walter Schloss, Warren Buffett, as well as the individuals behind the Sequoia Fund, Tweedy Browne, and others, all of whom materially outperformed the market over decades. These investors succeeded by largely ignoring external macroeconomic developments, enduring intermediate periods of underperformance, and focusing on buying shares in companies at large discounts to conservative estimates of their inherent worth. Euclidean’s approach draws from these simple models and also from the great value-investors of the past. We resemble the models in that we use quantitative research and a systematic approach. Like the legends of value investing, however, we believe that there are better ways of assessing a company’s value than crude measures such as price-to-book or price-to-earnings, and we develop a nuanced view of a company’s true character by analyzing its entire operating history. Like both camps, our investment process ignores the uncertain macroeconomic picture and makes no modification in response to volatility caused by other investors’ actions. We adhere to our investment process with the perspective that, across the volatile times of the past, value strategies have persistently carried the day. Similar studies to the one shown on the previous page are widely known, as are the track records of value investing’s most famous practitioners. Why then do investors and markets still frequently behave as though what has consistently performed over long periods will no longer work in the future? People seek predictions about what the future holds – Kahneman discusses how “an unbiased appreciation of uncertainty is a cornerstone of rationality – but it is not what people and organizations want.” This makes sense. Who wants a doctor who admits it is hard to know for sure what is ailing you? Who wants a leader who admits uncertainty? Few people do. In general, people want firm answers, and it is no different in the world of investing. Investors have a thirst for divining what the future holds, and there are big incentives for experts to share strong views. This leads to an environment of intense information flow where many investors, as they attempt to predict the future, focus on developments other than companies’ financial results. Yet people are bad at predicting the future – Kahneman describes how people are demonstrably bad at predicting the future. In one study he references, Duke professors collected more than 10,000 CFO forecasts regarding the S&P 500’s returns during the subsequent year. One might expect CFOs, armed with information regarding their sales pipelines and product forecasts, to have an edge in anticipating market developments. In fact, the correlation between the CFOs’ forecasts and actual market returns was less than zero. This is but one of many powerful examples Kahneman uses to show that “expert” predictions tend to be about as accurate as flipping a coin. Strikingly, Kahneman explains, even the knowledge that experts tend to be bad at predicting the future does not reduce individuals’ confidence in their own predictions and their thirst for “expert” prognostications. Investors frequently deviate from longstanding lessons of history as they react to their own and others’ predictions for how the future will be different from the past. Investors persist in doing this despite great evidence that their and others’ predictions have little value. We believe Euclidean’s investors will generate long-term profits from others’ well-intentioned but financially damaging departures from historically sound investment principles. In the look-through financials that follow, you will see some of the reasons we believe our portfolio is well positioned on both a relative and absolute basis. Our holdings have a collective enterprise value that is slightly more than three times the amount of pre-tax earnings they have generated on average over the past four years. This valuation comes in context of the S&P 500 as a whole having an enterprise value more than twelve times its collective four-year pre-tax earnings. This spread exists even though our portfolio companies have long operating histories and – in general and on average – look more attractive than the market as a whole when measured on long-term returns on capital, core balance sheet metrics (e.g., our portfolio companies, in aggregate, have more cash than debt), and revenue growth. We believe that the pessimism surrounding our holdings’ future prospects comes, in part, from broad economic and regulatory concerns, and in part from company-specific challenges resulting in near-team earnings and revenue deterioration. As discussed in prior communications, we own defense contractors in the context of the evolving fiscal cliff debate, healthcare companies in the context of an uncertain ObamaCare environment, and for-profit educators that are adjusting to challenging new regulations. We also own retailers and technology companies that have had difficult recent quarters, and some that have had significant exposure to the Eurozone slowdown. In situations such as these, when businesses experience setbacks and when the conventional wisdom is that difficult times are ahead for a particular industry or the economy in general, investors become pessimistic. This pessimism sometimes causes investors to be unwilling to hold historically good companies at almost any price. You can see this within Euclidean’s portfolio. Viewing enterprise value in relation to trailing four-year earnings, our portfolio would be valued similarly to the market only if 75% of the long-term earnings power of our companies went away. This is a big reason we remain confident in our prospects for strong future returns. Financial history seems unambiguous that, given our portfolio companies’ favorable balance sheets and long-term characteristics, it is unlikely that their collective futures will justify the current level of pessimism. Finding those companies where fear is most overdone is what Euclidean seeks to do in a systematic fashion and, we believe, remains the best way to compound wealth in the equity markets over long periods. In the simulations, Standard & Poor’s COMPUSTAT database was used as a source for all information about companies and securities for the entire simulated time period. The S&P 500 return is the total return of the S&P 500, which refers to the Standard & Poor's 500 Index with dividends reinvested. Simulated returns also include the reinvestment of all income. The simulation performance does not reflect the reduction of any investment advisory fees or the impact of trading costs. In each simulation, all NYSE and NASDAQ companies were ranked according the stated criteria such as Price to Tangible Book Value or Price to Earnings. In the Low Price to Earnings & High Returns On Capital simulation, companies were ranked on each metric, and then the sum of a company’s respective ranks was used to sort the universe of potential investments in order of attractiveness. Non-US-based companies and companies with a 2007 adjusted market capitalization of less than $100M were excluded from the ranking. Portfolios were constructed by investing equal amounts of capital in the top-ranked companies and holding positions for one year. For the three simulations, portfolios of 100 companies were constructed. The purchase and sale prices for a security were the average closing prices for the security over a 30-day period from the date on which buying or selling began. The amount of shares of a security bought in a month was limited to no more than 20% of the monthly volume for a security. Historical simulated results presented herein are for illustrative purposes only and are not based on actual performance results. Historical simulated results are not indicative of future performance.